We were in search for the best cheesecake within IT Park. I was out with a few friends and decided that maybe it was time for cheesecake hunting. It was a weekend after all. And cheesecake hopping we went. First stop was Coffee Bean and Tea Leaf. Hoorah! They have Blueberry Cheesecake! Prince bought it and we decided to move along. Startbucks had this Triple Chocolate Cheesecake. It was humongous. Was really hoping to find some New York Cheesecake CBTL had Chicago Cheesecake though but I wasn't tempted to buy it. Afterwards we went to that coffee shop near Skyrise. Forgot the name though, they didn't have any cheesecake and we then settled to chill in Coffeecat. I missed working here. Remember when I blogged about that elusive coffee shop way back August last year? Well, if not then here is the post. I never really got the courage to come back not until I was with friends. I also never got the chance to eat the hearty meals I used to cook. I will definitely be back. We saw a Melona sign at Chopstick within the eBloc Building in IT Park. 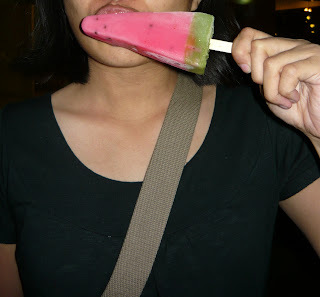 We went to check if they had some but all we got were the watermelon lolly, kiwi pop and the icecream sandwich. It even had black speck which resembles the watermelon seeds and as Febbe's testimony, "It tasted like peanuts." Cherry Coke the other variant of Coke way back the 90's. I loved the Vanilla Coke better than this one. There was no Fanta in the convenient store so I decided to have Yakult. It was a fun night and the weather did cooperate.